Can you believe it's October already? We've gone from daytime highs in the upper 80s/90s and nights nearly as high, to crisp nights nearing freezing and the sunny, but cool, breezy days of Autumn in just a few days! It's my favorite time of year! Thoughts begin to turn toward the Holidays and Christmas baking! Now that it's not too warm to use the oven, I'm thinking about COOKIES! And SWEET/SALTY NUTS! And CHEESECAKE! SALTED CARAMELS!!! The list goes on! I don't know if you're like me but I tend to put things off and then I'm up to my nose in things I wanted to do for the holidays and no time to do them! 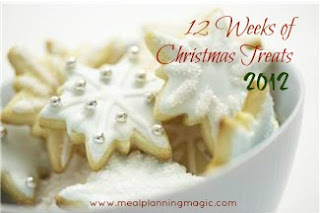 Other folks are thinking the same thing so I'm joining Brenda @ Meal Planning Magic and lots of other bloggers in a weekly recipe link-up to help you prepare for the Holidays a little at a time! Each week, we'll be adding our favorites to the list with a goal of giving you lots of recipes for your holiday planning. Part of the plan is to bake ahead of time and freeze our Treats so we always have some on hand for our guests, gift giving and our own Thanksgiving ("Cuz you know they're not gonna last all the way to Christmas!) and Christmas tables. and link up your favorite recipes. Lot's going on at our house and I missed the opening week. Bummer!